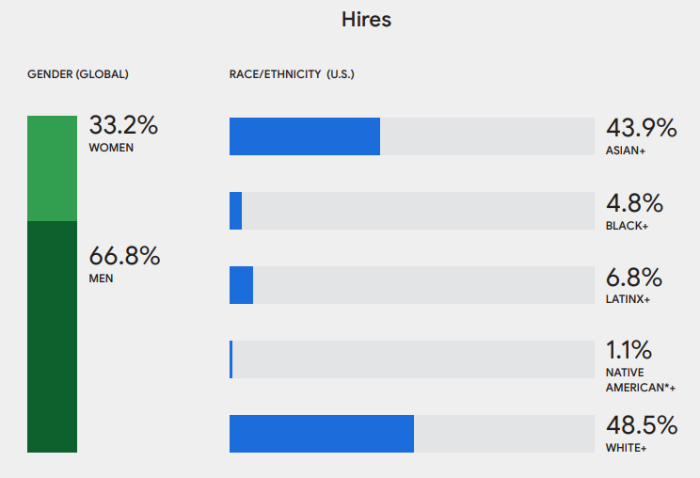 Alphabet’s annual diversity report shows biggest percentage point gains in Asian workers. 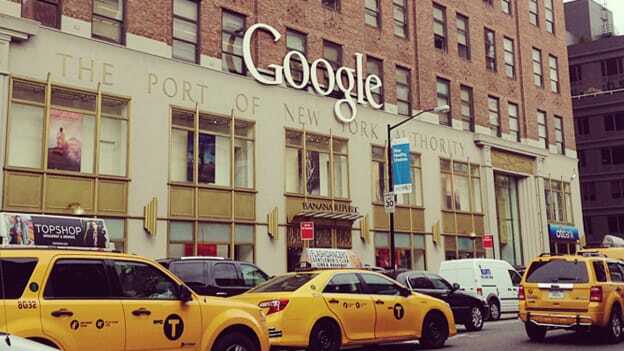 Google’s workforce employed fewer white, male employees while Asian workforce grew, according to the Google Diversity Annual Report 2019. The report finds gains in the number of women, black and Latino workers among new hires. The hiring of women rose to 33.2% (+1.9 ppts) globally and to 34.9% (+4.5 ppts) in the U.S which is one of the biggest increases for any underrepresented group. “Hiring is a critical indicator of future trends, so we’re encouraged by this momentum and will continue to invest in this,” cites the report. Women make up 31.6% and men make up 68.4% of its global workforce. In the U.S., 54.4% of the workforce is White, 39.8% is Asian, 3.3% is Black, 5.7% is Latinx, and 0.8% is Native American. The attrition rates for women and most under-represented groups declined, the Alphabet said in its report. However, black workers continued to have the highest attrition rates, which cited race data for U.S. employees. “Examining gender data at the intersection of race, we see that Asian and White women hires increased the most year-over-year, to 15.6% (+1.4 ppts) and 16.2% (+1.8 ppts) respectively. At the same time, Black women hires increased to 2.2% (+0.8 ppt), Latinx women hires increased to 2.7% (+0.7 ppt), and Native American women hires increased to 0.5% (+0.3 ppt),” cites the report. The overall representation of women in leadership increased. However, the proportion of women leadership hires decreased. “Our women leadership hires decreased to 25.9% (-3.5 ppts) globally, and to 26.0% (-2.4 ppts) in the U.S., This is an area we are prioritizing in 2019 by ensuring all leadership searches include candidates representative of the available talent pool. We’re expanding outreach to women leaders in Europe and Asia, and doubling the number of focused leadership events for women globally,” according to the report. Examining leadership hiring trends at the intersection of race and gender, we see that Latinx+ women leadership hires increased to 3.1% (+2.4 ppts). Asian+ women leadership hires decreased to 7.1% (-2.8 ppts), and Black+ women leadership hires decreased to 0.5% (-1.6 ppts). Asian+ men leadership hires increased to 25.5% (+7.8 ppts), while the proportion of leadership hires among men of all other racial groups decreased. On average, women are less likely to leave Google—a pattern that is even stronger for women in tech roles. In 2017, women were 6% less likely to leave Google vs. the average; in 2018, they were 10% less likely to leave than the average. “We saw improved attrition rates for Google’s employees of color in the U.S. compared to previous years (with the exception of Native American+ employees).” The already-low attrition rate for Asian+ employees moved even further below the Google average, according to the report. For the first time, the company also asked workers to self-identify among several other under-represented groups. Google found that 8.5 percent identify as LGBTQ, 7.5 percent identified as having a disability, and less than one percent identified as non-binary. Mastufa is the Associate Editor with People Matters global. You can reach out to him at mastufa.ahmed@peoplematters.in.